I recently received an email sent out by the Democratic Candidate for Treasurer. It linked Henry Glasheen the Republican Candidate for Treasurer to the “right wing” group The STAR Forum in a negative way. First, Henry Glasheen is not a member of our group. While most of the members support Henry in his election because he is a fiscal conservative, and qualified enough to handle this position, my main point of this article is to discuss labels. Labels are a way for the opposing view to denigrate individuals and groups. Going back in history, we look at the Nomad age. Those who were living on farms and in stable homes, also known as the Agrarian culture called the Nomads “barbarians.” Once the Industrial Age caught on, those people building factories looked at the Agrarian age as “Third World.” Each group wants to denigrate the other with a label. What might the Information Age call the Industrial Age builders? Polluters maybe. Many labels have been attached to the freedom movement, such as “tea baggers,” “racists,” “hate-mongers,” and “right-wingers“ etc. This type of label is not only inaccurate, but can fool us, if we as a people do not look at the entire picture. We have a right / left paradigm in our society, and I have used the terms myself. Liberal / Conservative is thrown around a lot as well, but with less negative connotations. If you are using a term to describe a standpoint, be sure you are using it with accuracy. Liberals call themselves liberals. That is not a derogatory term. I think it would be good to define right-wing. 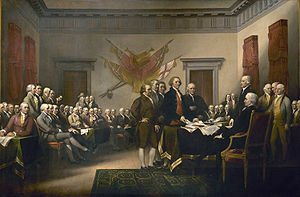 The video linked here is a video that shows why right-wing is the opposite of the definition many people place on groups intent on supporting the Constitution of the United States as seen through the eyes of the founding fathers. Right wing actually is a call for anarchy. This is not the case for The STAR Forum at all. The STAR Forum stands for Save The American Republic. I cannot imagine a Republican, Democrat, Libertarian or Independent not wanting to Save the Republic. Unless you believe in total anarchy or Fascism / Communism, we have common ground. If you believe in God or simply in good, we have common ground. If you believe that the Constitution of the United States is the law of the land, and holds government at bay to ensure the highest level of liberty for the people, then we have common ground. If you believe that government is necessary, but should be limited, we have common ground. If placing labels on individuals or groups is the only way to win elections, and it works, it will not be the fault of the person placing the label, but the individuals who are fooled by those labels and vote based on the “feeling” the label creates. Be an educated voter. Look at comments and phrases placed on opposing candidates in context. Do not believe everything you hear. Study things out for yourself. Find the candidates that align most with your views and belief systems. Above all else, remember that this Republic has lasted longer with our Constitution than any other written Constitution on the earth. It is the duty of all who take office, and all who vote, regardless of party to align themselves within the bounds of that document.